Ear plugs were made available for anyone who might be affected by the noise of fourteen people drumming – seemingly – for their lives. As it turned out, my ears took more of a bashing from the over-enthusiastic applause of the lady next to me. 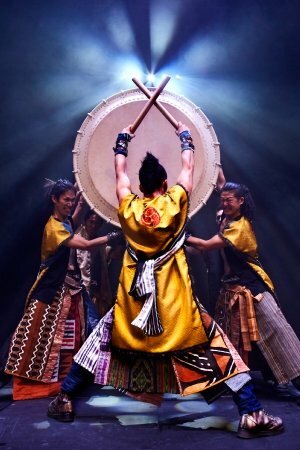 Indeed, Passion from Japanese drumming company Yamato is quite a revelation for those experiencing this kind of dynamic performance for the first time. For those who have seen their work before, however, some of it feels rather familiar, for good or for ill. Their charming formulae of putting on a ridiculously skilful show, combined with touches of slapstick comedy (think Mr Bean) and audience participation (of the collective sort, mind you), is repeated here. The press night audience largely lapped it up, though, so there’s not much point in reinventing the wheel. I can almost imagine a production at some point in the future that tries to depart from those crowd-pleasing elements, only for patrons to complain. It would be like a British pantomime without calls and responses: different, yes, but very, very odd and downright improper. The sit-ups of previous productions have made their way into Passion too, demonstrating the physique of the drummers on an elevated platform. Very nearly everything is executed with perfection – what didn’t go right is so inconsequential it doesn’t merit further comment here. Variety is the name of the game in this show, with small hand-held cymbals that might as well have been used for belly dancing, such is the flexibility of the performers, right through to a massive drum, shaped like a beer barrel, but considerably bigger (the words ‘garden shed’ come to mind), that dominated the Peacock Theatre stage, with appropriately oversized sticks with which to play it. Did I say ‘sticks’? More like baseball bats. There is a narrative of sorts, though one needs to consult the programme notes to follow it. But it isn’t necessary to do so to simply enjoy and appreciate the performance for what it is: a dazzling display of Japanese drumming, clearly developed with international audiences in mind. There’s drumming, there’s serious drumming, and then there’s Yamato. Yes, I thought one or two of the rhythms went on a bit too long, but there’s no doubting the stamina and dexterity involved. The lighting is nuanced; its relative calmness contrasted well against the sometimes utterly frenetic drumming that stretches far beyond the stuff of rock and roll drummers. Some one-upmanship goes on: in the first half, there’s a game of ‘my drum is larger than your drum’, an assertion repeated by competing drummers, again and again, until the stage is filled with drums of various sizes. Cue another rapid round of fast and furious beating. And yet, there is an elegance to this work, which is not, as it turns out, a relentless assault on the senses – there are some quiet moments, and even a pseudo-tennis match, in which the drummers ‘hit’ a ‘ball’ of sound across the stage – I realise I am making it sound corny, but it works. The choreography is vibrant and extremely precise. The grimacing and yelling put paid to any sense that all this is any way effortless, and there is the right balance between individual and ensemble performances. The so-called Japanese reserved nature, and the so-called British one, for that matter, were set aside for a couple of hours of sheer escapism. This was, all things considered, an exhilarating and worthwhile experience.